Sometimes, for an introvert, it’s hard to get out of the house. Although I’m pretty introverted, I can be enticed out by good food. Because of that, I’ve explored lots of restaurants in the Twin Cities, but I hadn’t explored what the cities have to offer in terms of my greatest food love—ice cream. That’s why I decided to spend a bit of time visiting a few of the best known ice cream shops in the Twin Cities. I didn’t make it to all of the spots on my list, but as fall is almost upon us, I thought I’d share my review of some of the tasty treats I’ve tried as we enjoy the last hurrah of summer. First on my tour of ice cream of the great North was Grand Ole Creamery. Grand Ole Creamery, one of the best known ice cream shops in the Twin Cities, is located in St. Paul on, where else, Grand Avenue. I hadn’t been there since I was a kid, but I have often been tempted by the smell of their fresh house-made waffle cones while shopping along Grand. If you are looking for flavor variety, this is the place to go. They offer 31 flavors daily, and make 200 different flavors per year (according to their website). For the indecisive, picking a flavor can be difficult. I was torn between the taro flavor and banana crème pie. After trying both, banana crème pie won out. To put it simply, the flavor was amazing. Summer is almost over, but I still think about that banana crème pie ice cream. If you are looking for a little Minnesota history to go with amazing homemade ice cream and cones, then give Grand Ole Creamery a try. Grand Ole Creamery, Photo Credit: Chiinferno, Alwaysuttori.com,. 2016. All Rights Reserved. Sebastian Joe’s is a family owned neighborhood shop with a thirty year history. Sebastian Joe’s is a feel-good kind of place. 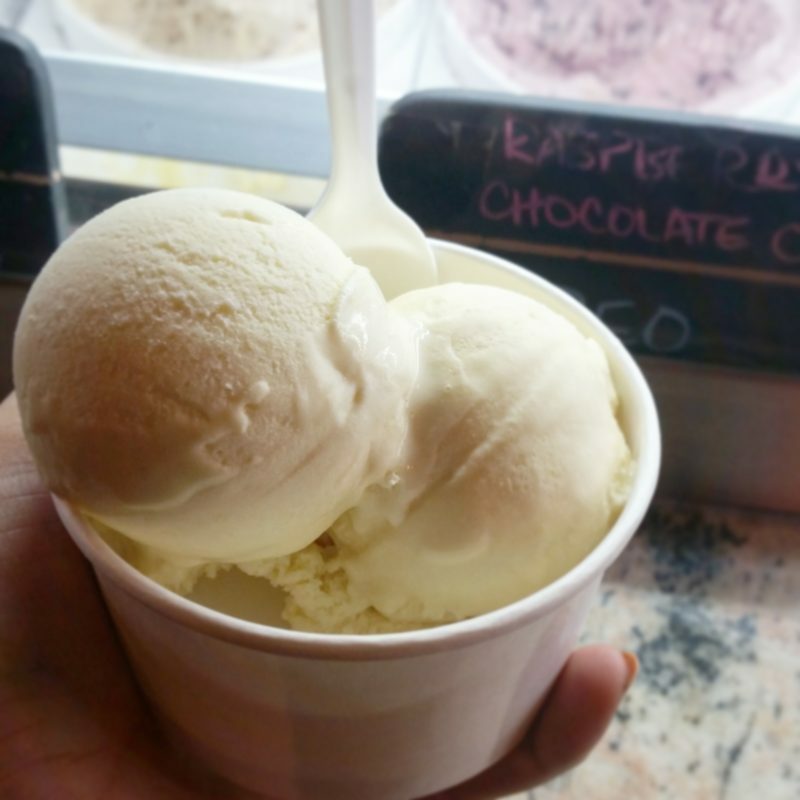 They handcraft their ice cream in small daily batches with organic, locally sourced ingredients; they focus on supporting the communities they serve by donating ice cream to non-political community organizations; they even make kosher ice cream. As for flavors, their flavors change daily (with seven signature classics always available). We went over Father’s Day, and the place was packed. I got two scoops, the first flavor was malted vanilla and the second, orange dreamsicle. The flavors were sharp and fresh, though, I didn’t enjoy it as much as I hoped to. I think the problem was that after a few bites, the flavors became one note, even mixed together. Perhaps I didn’t pick a good flavor combo, but I would recommend Sebastian Joe’s. We visited the Lowry Hill location, which has a nice patio on the side, and a bookish little sitting spot in the back of the store. Sebastian Joe’s is a great place for a bit of Sunday afternoon ice cream love. Pumphouse Creamery is a farm to table organic ice cream shop. All of their ingredients, from the milk and cream, to the wheat and flax seed for the cones, come from local farmers. They also have dairy free options mixed among their 20 flavors, which change seasonally. 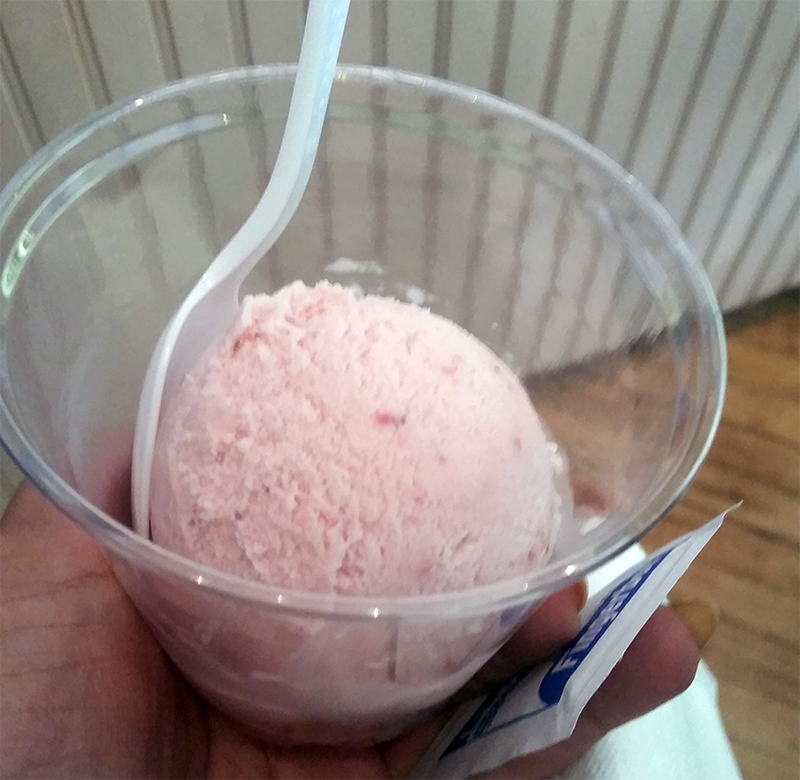 I tried one of their dairy free ice creams, a coconut milk and coffee flavor, but ended up picking classic strawberry (the strawberries they used in the ice cream are also locally grown and picked). Personally, I didn’t care for the ice cream. I found it to be more icy than creamy, and the strawberry flavor was masked under the milk. However, it may have just been an off day, but I can certainly appreciate a locally sourced farm to table ice cream shop. Not to mention, it’s in a really close knit neighborhood with mom and pop boutiques. So, while I wouldn’t make the drive from my suburb just for Pumphouse Creamery, if I happened to be in the neighborhood, I wouldn’t say no to a stroll about with ice cream in hand. Milk Jam Creamery is new to the Twin Cites scene, but boy have they made an impact. They’ve been talked about so much, it almost feels superfluous to include them on this list, except that it would be crazy not to. For an ice cream lover visiting the Twin Cities, Milk Jam is a must visit. I’ve been stalking Milk Jam on social media since they opened in January 2016. By the time I finally made it over to give their ice cream a try, the moment felt like a big event—a big event that didn’t disappoint. Not only does Milk Jam offer bold, quirky flavors like Ritz 2.0 (Ritz crackers and honeycomb candy), and Pikachu (Mango and chili). Milk Jam also offers both vegan and gluten-free options, a major plus in my book. Whether you’re vegan, gluten-free, both, or can’t get enough dairy, Milk Jam has an option for you. Better than that, the choices are actually tasty. I stood in line for about fifteen minutes before I could order, and even then picking a flavor was difficult. After tasting both Ritz 2.0 and Cereal Milk, I went with Cereal Milk. 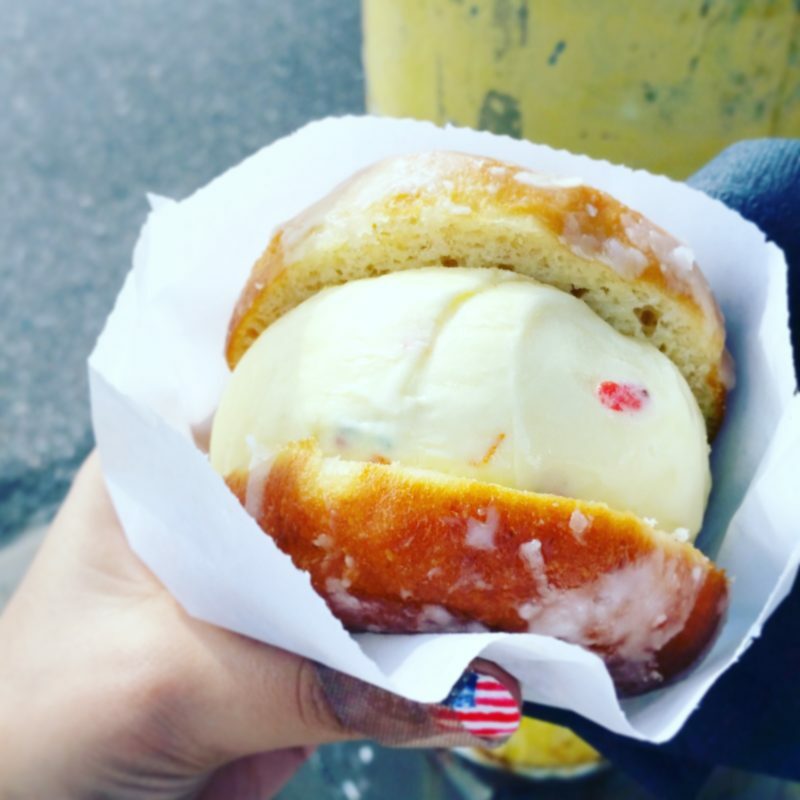 Then, just to up the ante on my passion for ice cream, Milk Jam doesn’t just have cones, you can also get an ice cream sandwich made with a doughnut from artisanal bakery, Glam Dolls. If you want an ice cream sandwich made with a cookie, you have that option too; but that’s been done before. I went for the doughnut. I did learn an important lesson, though. There can be too much of a good thing. The doughnut was good on its own, and the ice cream . . . it was amazing on its own. However, together I would say the goodness is too much. My brother disagrees. I’m glad I tried it, though, because it did make for a great experience. If you go, don’t be dismayed by the line, it’s well worth it. This is by no means a complete list of ice cream places in the Twin Cities. These are just the one’s I managed to visit this summer. Stick around, I may just update this list in the future. Also, you might have recognized some of these pictures from the Always Uttori Instagram. If you didn’t, what are you waiting for? You can follow Always Uttori on Instagram here!